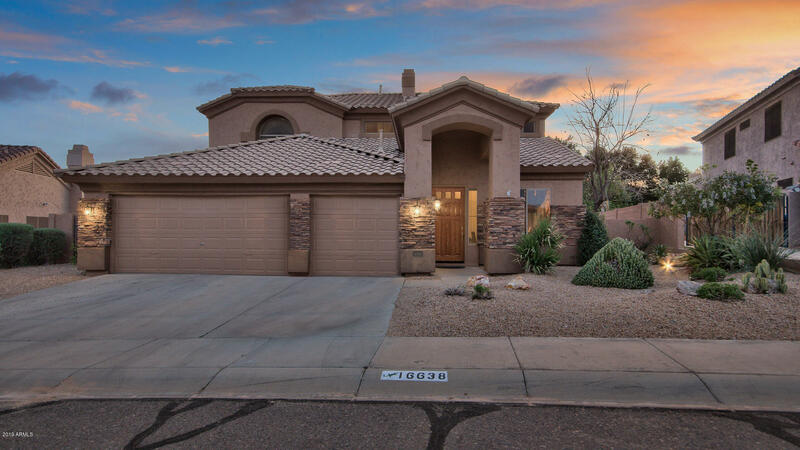 **Just won BEST HOME ON TOUR** Enjoy Ahwatukee lifestyle in this exceptional 5 bedroom/3.5 bath home that has been impeccably maintained. This popular Silverton floor plan includes formal living and dining areas plus a huge great room with a cozy gas fireplace. The kitchen is sure to please any chef with the beautiful staggered cabinets, granite countertops, stainless appliances, large island with breakfast bar and breakfast nook. In addition to the powder room, you will find a bedroom and full bath on the first floor that is perfect for guests. Upstairs you will find 4 more bedrooms, all with walk-in closets. The spacious master suite boasts separate tub and shower, separate toilet room, double sinks and huge walk-in closet. The garage includes a 2 foot extension and there is an RV gate to store your boat,trailer, or other toys. Step outside to your own private oasis that is perfect for relaxing and entertaining and featuring an extended covered patio, refreshing pebbletec pool with waterfall, grassy play area, and outdoor kitchen with built-in barbecue. The property backs to a common area so there is nothing to obstruct your enjoyment of the breathtaking mountain views. In addition to all this home has to offer, it is located in the highly rated Kyrene school district, in sought-after Foothills Club West with its hiking & bike trails, parks, lighted tennis and basketball courts and so much more. Put this one at the top of your list!